An official ceremony and gala will take place at Kennedy Space Center Visitor Complex on April 21, 2018. Set against the dramatic backdrop of the majestic Space Shuttle Atlantis®, the ceremony will be attended by a roster of astronaut legends. Later that evening, the newest hall of fame members will be celebrated at black-tie event hosted by the Astronaut Scholarship Foundation. Dr. Jones’ contributions to the U.S. space program have gone well beyond his 11 years with NASA, during which he flew on four space shuttle missions to Earth orbit. A graduate of the Air Force Academy and former B-52 bomber pilot, Jones joined NASA in 1990. He helped run science operations during STS-59, the first flight of the Space Radar Laboratory (SRL-1) and was the payload commander on the SRL-2 mission aboard STS-68 in the same year. His next two flights included STS-80 and STS-98, during which he successfully deployed and retrieved the Wake Shield Facility and led a series of three spacewalks to install the centerpiece of the International Space Station, the U.S. Destiny Laboratory Module. The author of four space and aviation books, he has engineered intelligence-gathering systems for the CIA as well as helped NASA develop advanced mission concepts to explore the solar system. The recipient of multiple awards, including NASA’s Exceptional Service Award, Outstanding Leadership Medal, Exceptional Public Service Medal and Distinguished Service Medal, Dr. Jones also had the Main Belt asteroid 1082, named in his honor. He is currently a senior research scientist at the Florida Institute for Human and Machine Cognition, focusing on the future direction of human space exploration, uses of asteroid and space resources and planetary defense. An accomplished fighter pilot who is known for his aerial acrobatic flights in the movie “Top Gun,” Captain Altman was selected as an astronaut candidate by NASA in 1995. His years as a Naval Captain led him to pilot his first two shuttle missions and then serve as a commander on his final two missions. In 1998, he served as a pilot on Columbia during the STS-90 Neurolab mission, which studied the effects of microgravity on the brain and human nervous system. Two years later in 2000, he piloted Atlantis on STS-106 during a 12-day mission to prepare the International Space Station for the arrival of the first permanent crew. He also commanded Columbia on STS-109 and STS-125, both missions to service the Hubble Space Telescope. In total, Altman spent more than 51 days in space during his four missions. He is a recipient of the Distinguished Flying Cross, the Navy Commendation Medal, and was the 1987 award winner for outstanding achievement in Tactical Aviation as selected by the Association of Naval Aviation. He retired from NASA in 2010 to join the ASRC Federal family of companies. The U.S. Astronaut Hall of Fame was spearheaded more than 30 years ago by the six surviving Mercury 7 astronauts. In November 2016, a new U.S. Astronaut Hall of Fame opened at Kennedy Space Center Visitor Complex, as part of the Heroes & Legends attraction. Each year, inductees are selected by a committee of Hall of Fame astronauts, former NASA officials, flight directors, historians and journalists. The process is administered by the Astronaut Scholarship Foundation. To be eligible, an astronaut must have made his or her first flight at least 17 years before the induction. Candidates must be a U.S. citizen and a NASA-trained commander, pilot or mission specialist who has orbited the earth at least once. Kennedy Space Center Visitor Complex brings to life the epic story of the U.S. space program, offering a full day or more of fun, inspiration and educational activities, including Heroes & Legends, featuring the U.S. Astronaut Hall of Fame®, presented by Boeing, the Kennedy Space Center Tour featuring the Apollo/Saturn V Center with an actual Saturn V moon rocket, Space Shuttle Atlantis®, Shuttle Launch Experience®, IMAX® A Beautiful Planet 3D and Journey To Space 3D films, Astronaut Encounter, Journey To Mars: Explorers Wanted, Science on a Sphere®, Rocket Garden, Cosmic Quest, and the new Astronaut Training Experience®, opening February 2018. Only 45 minutes from Orlando, Fla., Kennedy Space Center Visitor Complex opens daily at 9 a.m. with closing times varying by season. Admission is $50 + tax for adults and $40 + tax for children ages 3 – 11. Kennedy Space Center Visitor Complex offers annual passes starting at $75 + tax for adults and $60 + tax for children ages 3 – 11. For more information, call 877-313-2610 or visitwww.KennedySpaceCenter.com. The Astronaut Scholarship Foundation (ASF) participated in creating a venue where space travelers could be remembered – the U.S. Astronaut Hall of Fame, which opened in 1990. 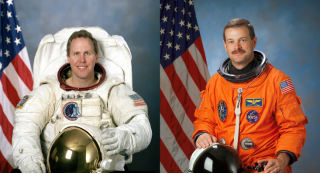 Today, the foundation serves as a consultant for the Hall of Fame, which includes conducting the selection process of astronauts for enshrinement by an outside committee. The Foundation's mission is to aid the U.S. in retaining its world leadership in science and technology by providing scholarships to extraordinary college students who exhibit motivation, imagination and exceptional performance in these fields, and facilitate programs to educate the public about the impact and importance of science, technology, engineering and math (STEM) education in the United States. ASF has awarded more than $4 million to outstanding Astronaut Scholars nationwide with support from astronauts from the Mercury, Gemini, Apollo, Skylab, Space Shuttle and Space Station programs who participate in this educational endeavor. For more information, visit www.AstronautScholarship.org.